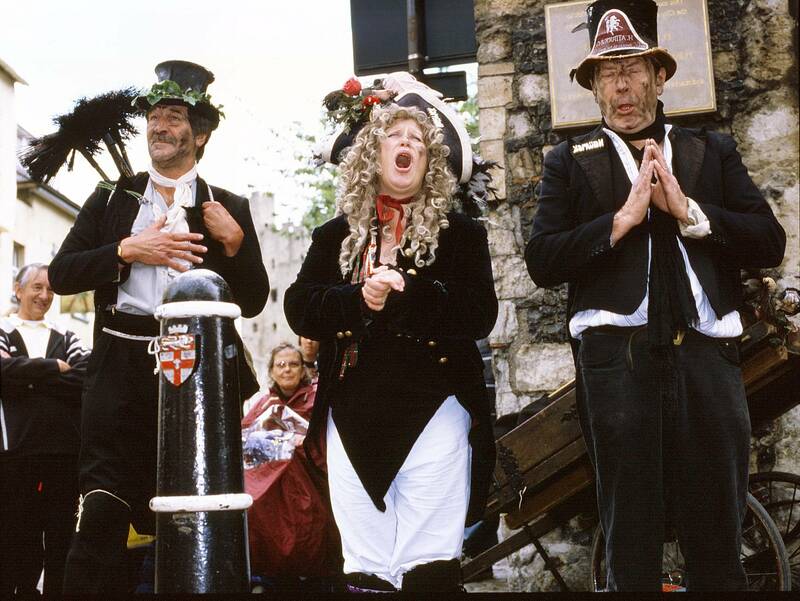 The annual Chimney Sweeps Festival in Rochester, Kent, England -- found in my files and never scanned to show . I used my 2002 Hasselblad 501CM + 80mm f2.8 CFE PLanar T*+ A16 back + 2002 outdated Fuji RMS film I have been given + weak flash fill-in. But were they any good? Singing, I mean. This reminds me. Back when we lived in Whittier, California, we had just bought our house, so that was way back in 1993, and there's this guy who came up and knocked on the door, and presented himself as a chimney sweep. He asked us if we'd had our chimney swept, and we said no, that we'd just moved in. So he offers to give us a free inspection and (or course) after the inspection, he said our chimney was indeed in need of sweeping. Well, I was kind of enamored of his presence and I just went, okay, fine, give it a go. His price was quite reasonable and he looked like he was maybe a week away from being homeless anyway, so I decided to hire him. Well, he did a diligent job, I must say. I mean, he put some good old fashioned muscle and sweat into his work. So I was reasonably convinced that we had a clean flue once he was done. But here's what made the whole situation so memorable. The guy was tall and skinny as a bean pole. And he was clothed, top to bottom in black, wearing a black suit coat and black corduroy pants. AND he wore a black top hat. He was carrying those long skinny poles with the brushes on top, even. He had his whole persona down pat, I'm telling you what. But the real kicker came when he handed me his business card. Chim Chimney McSweep. He told me he actually had his name changed to show how dedicated he was to his job. I wondered how good of a decision it was to be a chimney sweep, though. He arrived at our house on foot and when he left, he walked away down the block, and I recall seeing him in the neighborhood a couple of times after that, and he was always on foot. So I don't think he could even afford a car. And that's saying something when living in a place like Southern California. Still, I wished him well, and whenever I saw him, he brought a smile to my lips. Michael -- thanks for your Story -- contributions like that make this site more interesting !